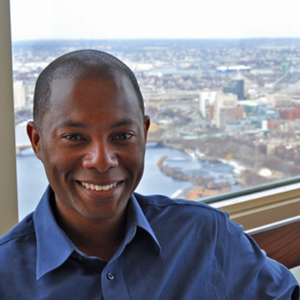 Derek Lumpkins is the Executive Director of Discover Roxbury. During his tenure, he has expanded and diversified Discover Roxbury’s portfolio of programming, including adding new biking and walking tours of Roxbury’s heritage, and the revitalization of community-wide events including Roxbury Open Studios and the Franklin Park Kite Festival with a creative community of partners. Derek is also increasing Discover Roxbury’s sustainability and social capital with a pair of annual events: Heart of the Hub, a celebration of Roxbury’s food, music, art and interactive experiences, and the Black & White Party, a nod to the energy, vibrancy, and color that artists bring to our lives everyday. As the head of Discover Roxbury, Derek also serves as the chair of the Roxbury Cultural Network, a collaboration of organizations and businesses around Roxbury, which collectively promote and develop new audiences for Roxbury’s physical, cultural, culinary, and historic assets. A native of Boston, Derek Lumpkins graduated from Boston Latin School. Afterwards, he attended Swarthmore College, earning a B.A. in English Literature, and the University of London (SOAS) earning an M.A. in International Studies and Diplomacy. He returned to Boston determined to make an impact at a local level and remains committed to this goal. In addition to working at Discover Roxbury, Derek serves on the board of directors for Egleston Square Main Street and is on the steering committee for ArtMorpheus. Discover Roxbury designs, organizes and conducts tours of Roxbury’s historic sites, arts community, cultural institutions and businesses. We nurture and encourage the community voice by developing Roxbury residents as tour leaders and acting as a resource that helps sustain community memory. We collaborate proactively with community-based institutions, businesses, and organizations. 1. Please share with us how you got started with Discover Roxbury. Derek: While working as a freelance designer in 2008, Candelaria Silva-Collins, one of Discover Roxbury’s former board members, suggested that I submit my resume to the organization because of my background in sales. I had never heard of Discover Roxbury before and didn’t really know what it did. But, I figured that at the very least it might lead to some additional design work. A few days later I sent a resume. Within weeks I was interviewed and eventually hired to assist Discover Roxbury’s marketing efforts. Shortly after starting, I skeptically attended my first tour. I had no idea what to expect and doubted that I would learn anything new since I am a Roxbury native. I couldn’t have been more wrong! As the layers of history and culture were systematically peeled away, my eyes and my mind were opened to a level of understanding and appreciation for my community in ways that I never had before. Prior to the tour I liked Roxbury and said that my commitment to living here demonstrated that. After that first tour, I became passionate about sharing my newfound knowledge of Roxbury and supporting Discover Roxbury’s role in the community. Four years later I’m still here and loving every minute. Derek: My mornings start off the same way: I eat breakfast, read email, and peruse the online newspapers while watching the Today show. I try to arrive at the office at least 30 minutes before any of my staff does in order to take care of the easiest tasks without disruptions, to set a course for the day’s events, and to know which questions I need to have answered before I attend meetings and begin making calls and responding to emails. My small staff is very friendly and outgoing. When they arrive, we welcome each other and talk for a few minutes before settling down to the day’s work. Work, however, is not an isolating experience. Despite our respective disciplines (programming, marketing, design), we work in a highly collaborative environment where discussion and question-asking are encouraged in order to draw upon everyone’s expertise and experiences. My staff asks me for input on their projects as often as I ask them for their perspectives on some of my initiatives. Lately, it’s become rare to have a day without meetings with partners and colleagues. Whether I’m hosting meetings, attending them offsite, or involved in conference calls, I’m always looking for ways to develop and enhance collaborations that advance our mission and raise the visibility of Discover Roxbury and our home community. I usually try to leave the office between 4pm and 5pm. Depending on the day, I may go biking, to the gym, or head home to cook dinner. Usually there’s another round of email check-ins to read messages sent by colleagues who prefer working after 7 or 8pm. After that, I shut down my computer and enjoy the remaining awake hours away from work-related items. Derek: The “trick” is basic organization and using the apps listed above. I make sure that all my calendars are up-to-date and synced so that I always know where I’m supposed to be and what I should be doing. The transit app helps me reach my destinations in the shortest amount of time. Tweetdeck keeps me informed of goings-on and in the loop, and it allows me to communicate while on the go. With so much on my plate, I also maintain flexibility with my schedule. If a meeting is cancelled or postponed to a later time, there’s always something to fill the void and keep me productive. 6. Given the current economic climate, what has been your strategy for building awareness of Discover Roxbury for short term and long term growth? Derek: Social media has been a major factor in building awareness of Discover Roxbury. Frequent tweets and regular posts on Facebook have been great at building short term growth. Long term growth is being achieved by being present. If we only pursued a social media strategy, I don’t believe that our participants would feel the sense of connection that we believe is important for long term, sustainable growth. As such, my staff and I make a concerted effort to be present and visible at a variety of local and regional events and to participate in the cultural life of the city as much as we would like others to participate in our events. Derek: I think I’m most proud of the heightened appreciation and improved sense of value that growing numbers of people have for the projects and initiatives that I’m involved with. I’ve chosen to attach my name and professional reputation to issues and situations with no easy fixes, limited resources, and few people who understand in their worth. As such, it’s exciting and rewarding to see a growing number of people supporting the causes and joining organizations that I care for and extending themselves to help me in my work. Derek: Given how much I enjoy my work, finding balance can be tricky because sometimes I don’t want to stop what I’m doing! However, I find balance in two ways. First, during the course of a normal week I go to the gym, bike, cook, spend time with friends, and make time to do nothing more than read. In addition to that, I take a multi-week vacation once a year during winter to someplace warm and sunny, usually to visit friends living overseas (previous trips have been to Guatemala, Australia, and Tanzania). Going abroad feels like pressing the proverbial reset button and helps me re-establish a sense of perspective that I may have lost over the course of the previous year. Joining the board of Egleston Square Main Street, which allows me to be active in supporting the improvement of one of Roxbury’s prime business districts. Teaching social media seminars to other local non-profit organizations. It’s great to share my knowledge and seeing it being put to use by others to improve their capacity and ability. Derek: There’s isn’t one person who has had the most influence on my career. I’ve been extremely fortunately to have a community of strong, interesting, and talented people who have been personally and professionally supportive. My peers and colleagues also continuously encourage me to pursue my own vision and to develop a style of leadership that is unique and best suited to my set of skills and challenges. Derek: Develop a clear vision of the results you want to achieve and the path by which you hope to achieve them. Once you have both of those in mind, share them. Be open to feedback and critiques, and be willing to incorporate those into the vision. There’s nothing wrong with revising an idea and being open to change and collaboration.